Diagram describing the network topology of QuickWire and the various connections that can be created between QuickWire server, users and devices. 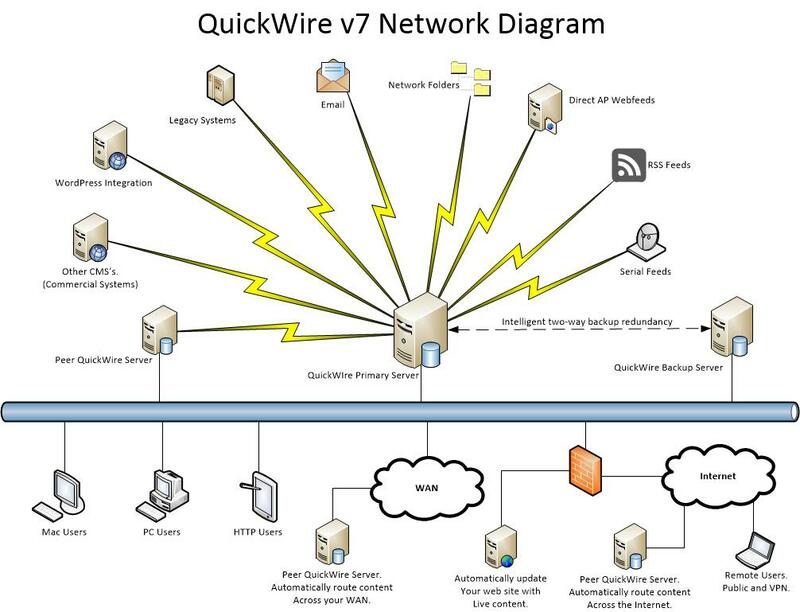 QuickWire is the client software that links users on their desktop computers to the wire service database. It supplies users the tools to instantly search the database for the exact story they require. Using either the Mac-based, Windows-based or the Web Browser-based QuickWire client software, users can search for and retrieve any of the thousands of wire stories in the wire database in milliseconds. For editors and reporters who regularly search for the same types of stories, there is a query management utility that allows them to build search profiles and save them in a user-defined location. These query lists are then instantly to the user from any location or platform used. Global query profiles can also be constructed for the use of all users. These global queries are loaded by every workstation at startup along with the personal list and are available at the click of a mouse button. Since the QuickWire database uses Internet Search Engine technology, all of the search and query functions of QuickWire are extremely fast giving editors and reporters almost instant access to any wire story. QuickWire allows users to view the wire database in a variety of ways. The simplest view is the short view wire window that lists all of the stories in the database in a spreadsheet view with the latest wire story arrival at the top of the screen. The click of a single key changes this view to a long view that will list a user-defined number of lines of the wire story in the same spreadsheet view. Users can then either search this view for the particular story they need or open the story in QuickWire's own editor and skip through stories from the editor window. If the user is browsing photos only they can switch to a thumbnail view. The user can dynamically resize the thumbnails to any size desired. When a user finds the desired story in the database and marks it or takes a copy of it, QuickWire remembers and keeps a record of all copies, who made them and when. This audit trail is available to all users to determine if a story has already been assigned to a page or not. Users can also export the files to disk in a variety of formats, they can tell the QuickWire Server to export them, they can send the file directly the MS Word, Email, Quark XPress, Quark CopyDesk, Adobe InDesign or InCopy. The latest addition to the QuickWire suite is the Web Client. The Web Client allows access to the same database as the regular client via a web browser. Users can use and save their own query sets, view text & photos in long, short and thumbnail views as well as check content in and out of the system. Users can batch download content or run it through a server-side export routine. There is also a Mobile Mode allowing mobile device users to access the content in a convenient format. Every newspaper, radio or magazine newsroom is unique in the way work flows from reporters and editors into the final product. No two newsrooms do these things the same way and QuickWire was designed to accommodate this flexibility. QuickWire was designed and created in a newspaper newsroom and is simple to customize and configure for your newsroom no matter how you have evolved your work flow. WireSet is a utility program in the QuickWire suite that lets network managers configure their site installation just the way they want it so it enhances current work flow patterns and makes QuickWire a comfortable fit the first time it is run. WireSet is used to configure the GetWire service and make it perform its magic the way you want it done. It's a powerful system management tool that lets every QuickWire site make its own decisions on the look and feel of our software. You control what QuickWire does for your newsroom, not the other way around. Also included in the QuickWire suite is a monitor program called WireMonitor that opens a window on all the action taking place in GetWire. Since GetWire runs as a service under Microsoft Windows NT it does not interact with the server desktop. We have therefore created WireMonitor, both Mac and Windows versions, that keep an eye on the activity of GetWire. Network administrators can use WireMonitor to run purges, rebuild the QuckWire database and do many other important housekeeping operations. Through the use of our WireMonitor application (Windows and Mac), the Administrator can remotely (in real time) view the GetWire port statuses and system log. The data streams themselves can also be monitored, captured and inspected! Commands can be sent to the GetWire server allowing full remote Administrative access. Access can be Secured only to Administrators or remote commands can be disabled for "Monitor Only" users. The GetWire component of QuickWire’s software suite is the hard-working front end that captures all the data for the QuickWire database, manipulates the files, translates file content and indexes every word of every story before sending them to the database. Configuration of the GetWire program is done using the WireSet software package. By using WireSet the system administrator can control every minute aspect of GetWire’s setup. GetWire is a 32-bit program that runs only under Windows NT Workstation or Windows NT Server version 3.51 or greater. GetWire can monitor up to 256 logical data streams configured either as wire feeds, network feeds or modem feeds at a variety of speeds with full character and string translation capability on each I/O port. This translation capability lets GetWire tag all incoming stories with site-definable style tags for most composition systems new or old. It can also strip out the fixed spacing in sports agate and stock listing files and replace them with proper tabs and style tags for easy layout and pagination of sports scores and stocks. If you have remote bureaus or stringers who file to your newsroom via laptop computer and modem, GetWire can be configured to accept modem feeds and place the stories in the wire database. If you use Apple Remote Access to receive copy from remote locations, GetWire can monitor the network input directory and take a copy of any stories dropped there for inclusion in the wire database. GetWire not only captures incoming wire and remote files, but it can send files out to remote systems as well. This traffic management feature can make GetWire and QuickWire a pivotal piece of equipment in bridging an older proprietary editorial system to the new desktop publishing world. GetWire will capture, index, translate and store files from most aging editorial systems and pass back translated files from the desktop no matter what their origin. GetWire indexes every word of every story for instantaneous word searching by the user. Regular (RS-232) port usually addressed through a specified IRQ and base address. These are the most common type of ports monitored by GetWire and are usually addressed through a multi-port expansion card or the standard COM port on the host PC. ALL serial ports are accessed through NT COMn devices that can be intelligent or non-intelligent serial adapters. Folder Input ports . GetWire can be configured to monitor a "hot" folder anywhere on you local area network. Any files copied to or dropped in this Network drop folder will be processed in the same way a file would be from any other source. The file will be run through the translation process, indexed and put into the QuickWire database. QNN ports are used to either send files to or receive files from another QuickWire site reachable through your wide area network. GetWire will also poll an E-Mail ID to receive and send out e-mail. Backup. A GetWire port can be configured as a Backup port that sends and receives files from a backup server properly configured with GetWire software. FTP Port . GetWire can poll data from any FTP server. It can scan through - read only - sub-directories and execute scripts on completion of downloaded files for enhanced processing. TCP/IP Port. GetWire can connect to (or be connect to) any direct TCP/IP stream. The QuickWire LoginService handles all Client sessions as well as the story database (currently using embedded AltaVista technology). This allows the User to search instantly on any Field, Word or Phrase. Since the LoginService uses TCP/IP for the Client/Server protocol, users can access the database from anywhere very efficiently. All query notifications (Watches) and document revisions are handled by the LoginService. All user transactions can also be sent to a backup server allowing the backup to be a fully independent and identical database. Customers can purchase an annual software support plan. For an annual fee users receive direct telephone technical support plus free upgrades to all new QuickWire versions.